As any of you familiar with the brand already know Brainwavz have a great reputation for producing headphones and earphones that perform well beyond their price bracket. One need look no further than the famous B2 Knowles TWFK based IEM's and the HM5 headphones to see the ethos stands on great sound at low price. 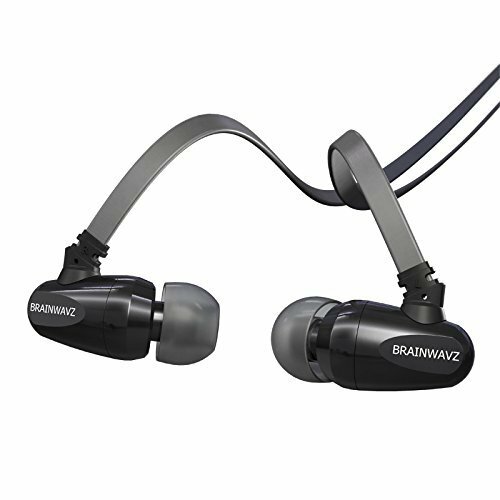 In the case of the Brainwavz R3 the company has dared to be different and proposed a new design for the popular use of multiple driver earpieces. The R3 has 2 drivers which face each other (one for high/mid the other for lows) and blend the music in a centre chamber before the sound exits through the nozzle placed in the middle of the earpiece. Its a unique, bold and daring design, both technically and aesthetically. Its time to take a look and see how it performs. Packaging is very simple and in line with a lot of mid priced IEM's. A cardboard box with a plastic insert displays the R3's nicely and while nothing fancy it gets the job done. By keeping the packaging simple I assume Brainwavz are able to keep the cost down. Thats fine by me as when I open a set I most likely never bother to look at the box again anyway. The R3 comes with a fairly standard set of accessories albeit with some nice extra touches. You will find a range of regular small medium and large tips along with a medium bi and triple flange set. Whats nice is that they also include a medium set of comply T500 an excellent semi-hard carry case, a airline adapter and finally a very nice stereo jack adapter which is designed to match the aesthetics of the R3. All in very nice. Wow, these are nothing like I had expected. I had originally thought that they would be a very small set of monitors, however its not the case, the housing is huge. Build quality seems stellar, tank like and indestructible. The housings are a solid metal with decent weight to them they feel rugged like you could run them over with a truck and they would come out looking the exact same. The cable is also extremely durable its very thick and strong feeling, a massive departure from the cable of the B2's, this one looks like it will last a long long time. The memory wire has now been removed from the earphones so any worries about this are long gone in the current versions. The Y splitter is large and seems very strong and the jack, is again, very good. All things considered, this is an extremely rugged set of IEM's and seems like they will last many many years of rough treatment. In a way this is a nice departure from feeling like I have to treat my IEM's like a piece of fine china with the R3's you could just toss it in a bag and forget about it. With regards to the look and style of them I have to say I love it. Its one of the coolest designs of the year and it comes from a result of pure function based design ethos. I cant think of anything else on the market that looks like it and whilst not being the fine finished beauty of something like Chord and Major or stylised like a set of Denon or UE they do have there own charm. Brainwaz have dared to venture off the path of normal and in regards to the industrial style of the R3. It may not be for everyone, it is very utilitarian but Brainwavz have shown they aren’t afraid to be different. Certainly I was worried on first seeing the size of the R3 how they would fit. For myself though they sat in the ear beautifully with the top of the earphone (they are meant to be worn over ear and top pointing down) resting on the bottom of the inside of my ear next to the tragus and anti tragus. The over the ear design eliminates cable noise and the memory wire works great at keeping them locked in place. I have heard though that this may be shortened in the next iteration. It is not a problem issue, merely just a quirk. *since the original review Brainwavz have listened to consumers and removed the memory wire and all reports point to a now excellent performance in this regard. I was a bit shocked upon first listening to the R3 I was a bit underwhelmed at the power of the bass. I thought with one of the drivers in each earpiece being dedicated to bass that this would make it quite heavy and emphasised. Couple this with fact that I have been using the monster gratitudes for around a month now my ears have been more or less tuned to that sound. What follows goes to show do not give up on a set of phones after 5 minutes, give your ears time to adjust and you will be grateful. I decided it was best to leave out the harder hip-hop and bass heavy electronic music after a few tracks and concentrate on the rock, classical, reggae style and im glad I did, they perform very well in this regard. Soundstage is huge on the R3, possibly as close to out of head and as close to circumaural as you can find in a IEM. It is big with an airy sound that makes a lot of tracks shine. Highs – Highs are nice and clear with a sparkle on them. Mids – Mids are very clear and presented with an intimate presentation to them. They sit just on the warm side of neutral but what really stands out is just how smooth the presentation of the mids is, most likely the smoothest mids that I have ever heard on an IEM. I suggest anyone to listen to Fleetwood Mac white lies through on these, you will simply be blown away. Its a floaty and smooth presentation making with emphasis on vocals. Joan Baez and Charlie Simpson both sounded fantastic and showed the R3's great performance for fans of acoustic rock/folk. Lows – The bass response is pretty weak on the R3, especially in regards to sub bass of which there is very little of. Mid bass is accurate but is more akin to levels one would find on a set of Etymotic ER4, Hifiman RE272/RE0 or indeed Brainwavz own hugely popular B2 model. Its not a phone for electronic or rap but works perfectly on less bass intense genres allowing the more upper regions of the sound spectrum to take centre stage. The best way which I can describe the sound of the R3 is clean clear and open. The smoothness when paired with the right music is brilliant. Listening to something like Roberto Cacciapaglia and Ludovico Einaudi on the piano is truly engaging and the R3 can be forgiven as not being fully analytical/detailed as due to the sense of intimacy and connection they create it more than makes up for it. One thing to be noted was that I found them to be source dependent. Just playing around with a few of the source combos I found it didn't sound too great out the nexus 5 (and this should be noted that the nexus 5 is not all that impressive when it comes to audio) but when paired with the Ibasso DX50 or imod and JDS combo they shine as to compete with other IEM's costing in the £100-£200 range. Brainwavz have gone and done it again providing a set of IEM's offering great value for money. I cant think of a set of earphones that will be more durable than the R3. The rugged construction combining solid metal housings with extra thick cable and impressive Y-splitter and Jack points means that this is one set that should last through years of abuse. Users of the now ageing B2 headphones will find these a solid replacement. In terms of the signature sound it is very close albeit sacrificing some detail and speed in exchange of a more open, airy and intimate sound. Its a sound profile that suits classical very well but shines with aplomb for lovers of acoustic and melodic rock. In a world earphones where the trend lies with thumping bass and muffled mids, Brainwavz are there to have you covered with this mid centric classy sounding IEM. At around £80 shipped to the UK the R3 does have its fair share of competition. Not many though are available with the cooler sound signature and tank like construction of the R3. With all that considered it stands to reason that Brainwavz have again created another great performing phone for less money than you should be paying. *Please check back this week for more Brainwavz reviews for the S1 IEM's and HM9 Headphones + a bonus quickie review of the Brainwavz delta.